There’s no denying that there’s been some excellent Zelda merchandise and collectable made over the years. From First4Figures statues to miniature Hylian Sheilds and Master Swords. From Bobbleheads to Pez Dispensers. Yep, Zelda has had it all. Now, there’s some new Zelda merchandise appearing on the ebay market from E3. 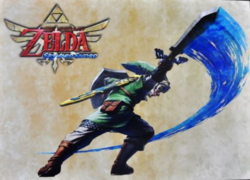 The main merchandise that has appeared on ebay during the aftermath of E3 are posters featuring official art from Skyward Sword. So far there are three posters of Link – here, here and here. There’s also one featuring Zelda and another featuring Lord Ghirahim. Personally I’ve already bought myself a poster featuring Zelda, merely because she’s my favourite character. Other than that I quite like the poster featuring Link flying on the red bird. Which one do you like, will you be purchasing any of these? There have also been a few other Zelda and Nintendo post-E3 items on ebay that haven’t appeared as much as the posters, such as these Skyward Sword Zelda Lanyards. A Zelda pin badge of the Hylian Shield and Master Sword also features in this collection here. Looks like Nintendo went for it this year with the promotional items! I think they’re all excellent – not just the Zelda stuff, I wouldn’t mind that Starfox pin badge – but for me everything but the posters are a bit too pricey. What do you think of this sudden rush of E3 Zelda items on ebay and their price? Do you have any of your own Zelda merchandise yourself that you love? Leave us a comment telling us about it.